Mango as a topping seems strange, isn't it? You are right. While my friend and I were at the supermarket, we were wondering what topping we should put on pizza. My friend likes pineapple so we went on the preserved fruit. 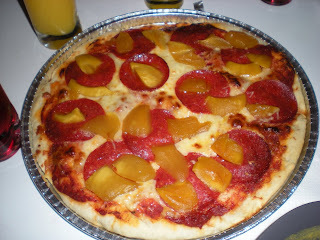 I actually joked about mango pizza and she said that we should try this experiment. I said that it was a bad idea, because it can't preserve the freshness through baking, not like pineapple. We ended up trying it. It tasted good but not superb. 2. Spread dough on pizza plate. 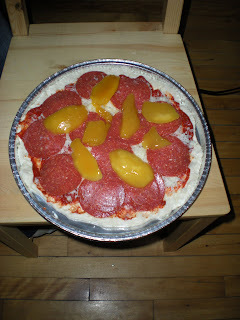 Spread pizza sauce on top of the dough. 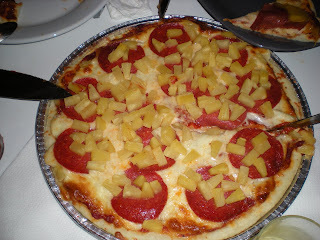 Add cheese and finish up with the rest of toppings. 3. Bake for 20 to 30 minutes. Let it rest for a few minutes. Serve.